Belfast has today been announced as the first city in Northren Ireland to benefit from Openreach’s fibre-to-the-premises (FTTP) roll-out programme ‘Fibre First’, where fibre optic cables are laid from the exchange directly to people’s front doors. The news will provide a boost for the city’s already thriving digital sector, which generated £875 million in turnover last year. Those working from home will also benefit as the technology is made available to tens of thousands of homes and businesses in the area, providing more reliable and resilient connections. The Crumlin Road, Falls Road, Shankill Road, Shore Road, Malone Road, Ormeau Road, Lisburn Road and the Upper Newtownards Road areas will be the first of the city to be connected. The fibre connections will provide speeds of up to 1Gbps, about 24 times faster than the current UK average of 44Mbps, helping to ensure that Belfast can lead the way in digital innovation for decades to come. Openreach’s commitment to Belfast comes just weeks after the publication of the new Belfast Region City Deal,which announced several exciting digital innovation projects across the city - including a Centre for Digital Healthcare Technology; a platform for the city’s research community, entrepreneurs and industrial partners to collaborate on data science; and a new cross-disciplinary digital innovation hub for Queen’s University. Mairead Meyer, managing director of the newly-named Openreach Northern Ireland team, said: “We are delighted to support Belfast’s digital ambitions. The city is already a key player in the global digital economy, and we are getting on with building the digital infrastructure it needs to stay ahead. As we build our fibre network directly to people’s front doors, we remain committed to staying at the forefront of innovation and providing customers with the digital connectivity they need and deserve. 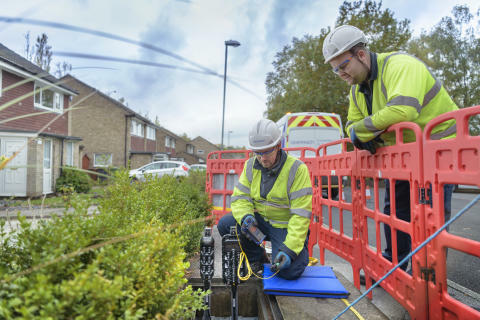 Since starting our UK wide ‘Fibre First’ programme, our engineers have built full fibre broadband technology to more than 650,000 premises, reaching thousands of homes and businesses each week. “It is brilliant news that Belfast will be the first full fibre city in Northern Ireland. At the heart of our Belfast Region City Deal vision is a drive to deliver inclusive growth and to focus efforts on areas such as the digital sector where we can become genuinely world class. Belfast joins a dozen other locations across the UK that make up the first phase of Openreach’s multi-million pound fibre investment, which will initially connect up three million homes and businesses by the end of 2020. The ambition is to build FTTP to around 10 million premises by the mid-2020s and ultimately to the majority of the UK under the right conditions. FTTP connections provide even greater capacity for multiple devices and data-hungry services, from high-speed uploads and data sharing to smart home applications and Virtual Reality. The technology can also be a catalyst for greater productivity and improving the way businesses work, enabling SMEs to explore and compete in global markets, use more effective technology, systems and processes, as well as operate more efficiently thanks to improved reliability.